Before the sun rises each day, Fahima is out tending and watering her small plot of land. She works hard to grow the wheat and corn that she will sell in order to provide for her family. Unfortunately, her earnings are rarely enough. No matter how hard she works, Fahima sometimes struggles to meet the needs of her four children. Feelings of uncertainty and fear weighed on Fahima when she learned she was pregnant again—she couldn’t help but think how much more difficult their situation would be. In her poor, remote village in Afghanistan, it is especially difficult to access health care. Medical facilities are too far away to travel to. Even if they were accessible, many poor families like Fahima’s can’t afford the care they need. This meant that Fahima would go through her pregnancy and delivery without the care of a skilled health worker. Without this expertise, complications during pregnancy and delivery can be life-threatening. Two of the ways PWS&D is helping mothers and babies survive childbirth and lead healthy lives is by supporting the construction of health centres in remote communities and training community health workers to improve practices related to maternal health. One day, a woman from Fahima’s village stopped by to share that she had just come from a new health centre that provides free medical care to support women during their pregnancies. The centre is one of six new facilities supported by PWS&D. The next day, the woman accompanied an encouraged Fahima to the clinic where she met with a midwife for a check-up. Since that first visit, a community health worker has been meeting with Fahima at her home to monitor her pregnancy and provide treatment. A midwife also visits to teach Fahima about maintaining a balanced diet and improving hygiene practices to help her and her baby stay healthy. Her family is still poor, but with the availability of health services, Fahima is improving her own and her children’s well-being, feeling strong, more productive in her work and above all, hopeful. 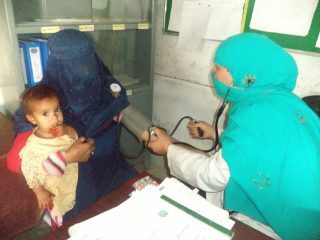 Deliver hope to more mothers in vulnerable communities in Afghanistan by helping improve life-saving health care systems. When mothers and children are healthy, communities prosper. *PWS&D’s maternal and child health program receives generous funding from the Government of Canada through Global Affairs Canada.